Ah, these Halcyon days - how they fly by when lunching with nuns and breathing fresh mountain air. Tough realizing today was the last day in Shanxi. Also tough to sleep with firecrackers going off. Right outside your window. Every 3 minutes. The last full day happened to be Mid Autumn Festival - one of the more notable festivals here in China - and what’s a festival without firecrackers. Firecrackers and mooncakes. We spent the day listening to this continuos cacophony and wandering in and out of Buddhist caves. 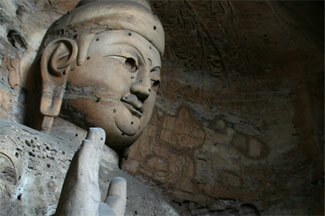 Each cave along a series of cliffs near Datong held numerous carvings - from small Buddhas to 20 meter behemoths - all in various stages of decay. Some still revealed patches of vibrant color - deep reds, luminous yellows and clear blues - others were barely human in form, so weathered their bulbous heads barely stood on a thin strand of rock neck. Our teacher friend from last night met us before dinner and took us to a local noodle place - but not before she tried convincing us that we didn’t need to leave Datong at 7:00AM for Taiyuan, and that we should come to her school for “just 15 minutes” to introduce ourselves. Typical China surprise. After a successful skirting of that issue we grabbed dinner and said goodbye. Mid-autumn Festival needed some partying though - and we obliged. Datong is a pretty typical large Chinese city. Crowded, noisy and often a bit taxing on the olfactory senses. Wading through this we found a multi-story club and made our way upstairs for pool and a few beers. Note: Beers with names like “DryBeerKing” don’t always satisfy. A few horrid games of pool later we were on our way downstairs when we felt the bass-line kick in. The floor below the poolhall was a genuine club and in our attempt to have a peek we were ushered to a frontrow table - laowai VIPs. Frontrow to a raised dancefloor. A dancefloor on springs - think of it as a giant tiled trampoline. Frontrow to a long-haired Michael Jackson impersonator - moonwalk, gerricurl and white-gloves included. Frontrow to Chinese poledancers looking completely unenthused in their conservative garb. All in all the perfect venue to vent some of our laowai influence. We were soon on the dancefloor eliciting club-wide chants and engaged in a competition to get the most locals doing the most ridiculous dance. This culminated with a group of us leading a Russian Cossack dance. To club trance. With the evening winding down a friendly PLA Airforce captain and his posse took us for a after-club meal. Tutou. A large bowl of tutou, loads of yang ro chuar and a few bottles of beer later we settled into our beds for an hour - we had to be up at 6AM for our bus. Naked. Mole. Rats. - Did you know that naked mole rats are eusocial, cannot regulate their own body temperature and lack a nuerotransmitter that allows them to feel pain? Bacon. Gin. - The (un)holiest of meetings. The bacon martini. $0.00 9/10 - How much do you cost a mile?